Ben Pearson Jr. has shared some video of his Dad doing some shooting on moving targets. Great shooting, there. I agree Van...my all time favorite archer. My dad reminded me of my first bow he gave me when I was young..honestly, I didn't even remember getting it until he reminded me- because it was too much bow for me at the age I was..and it went in the attic and was forgotten. My dad knew nothing about bows and I didn't either..but I had seen a short film at the movies of HH I think, and it got me all fired up so he went out and got that bow. Think the sales guy must have picked it out fitting my dad instead of me! It was a Ben Pearson(looked like lemonwood)selfbow, came in a wooden box, with 6 of those knitting needle forgewood target arrows, an armguard and finger stalls. I'm really surprised we don't hear more about Ben. He was an excellent shot. I've had the pleasure of speaking to his wife and daughter at our Ben Pearson Memorial Shoot in July. His wife loves to tells stories about Ben & Howard. Ben Pearson was the greatest archer of his time.He was a thoughtful person as well. He thought of the less fortunate among us when few other people cared. Great photo Van. I love seeing these old photos. Thanks for sharing. Shooting moving targets is one thing. Ever tried it out of a boat like that? I'm sure I'd end up in the lake. 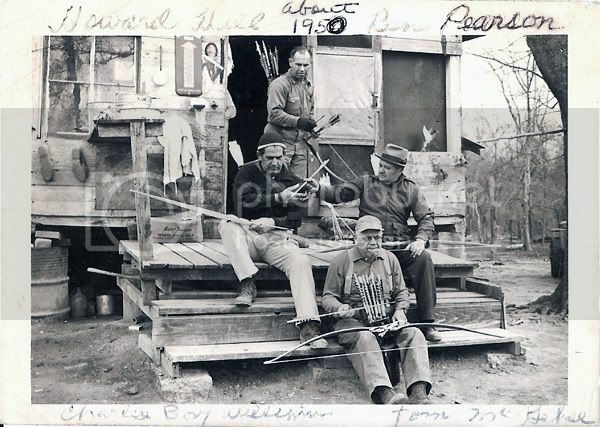 great footage.im a big fan of his bows.stillshooting a mid 1950s long bow of his. Ben Pearson also made some beautiful, smooth shooting bows. I have a half dozen or more. Awesome piece of vintage footage. It is always great to see pictures of the pioneers of the sport doing their thing. Doncha just love those old shacks. Looks as if one corner is sitting on a 50 gal.barrel! I saw a clip of Ben Pearson wing shooting ducks . I have a hard time hitting a Pheasant with a shotgun , it was amazing seeing him hit a duck in flight with an arrow . I'd like to see more videos of his shooting skills . What a beautiful sight that is. Very nice photo. anywhere to get a full video of the man? I have "The Legendary Hunts of..." Any others? "It is the difficulties of archery that make it so interesting to true archers." i am a new shooter to the sport and a good frind gave me a bow,it was a 54in ben pearson made in 1970 i have found out.it is a great one at that.i have been reading abought the man and all that he has done for the sport.i am prond to learn on a bow that has is name on it.O YEA! Back then i always liked the pearson bows over the bears (50-60s). what do you mean shack, thats a hilbilly mansion.